Whatever your moving needs may be, our Sherman Oaks movers are ready to help you get settled. Our professionally trained student-athlete movers and our moving concierge will be with you for the entirety of your move. If you are moving to or from anywhere in Sherman Oaks, we are the moving company for you! Our Sherman Oaks movers are professionally trained student-athletes, and our moving concierge service will be there to help you with every stage of your move. This San Fernando Valley community, part of the City of Los Angeles, is rich in history and culture and is an excellent place to call home. Sherman Oaks was one of the first Valley areas to be extensively developed, and today, it’s highly urbanized. Residents and visitors will enjoy a trip to the Sherman Oaks Galleria and the annual Sherman Oaks Chamber Street Fair. Held the third Sunday in October, the fair is San Fernando Valley’s largest event, drawing around 100,000 visitors each year. A half-mile stretch of Ventura Boulevard is turned into a pedestrian mall with attractions, entertainment, food and fun for all ages. If your idea of fun is more athletic, Van Nuys Sherman Oaks Park will fill the bill. Baseball diamonds, basketball, tennis courts, and an outdoor heated swimming pool attract the fitness minded. Of course, the greater Los Angeles area and its huge array of entertainment, recreational and cultural attractions are just a freeway jaunt away. 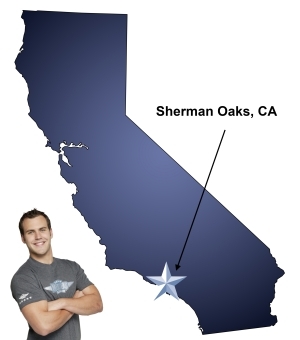 If you’ve made the wise decision to move to the area, make another one and hire our Sherman Oaks movers. Meathead Movers specializes in local, long-distance, and commercial moves to, from, and within Sherman Oaks. We also provide reliable packing, storage, on-site relocations, and our distinctive moving concierge service, which connects you with local service providers. Whether you’re relocating to Sherman Oaks or just moving across town, Meathead Movers is your best choice. Our clean-cut student-athletes are extensively trained to handle your precious possessions as gently as they would their own. They are dedicated to providing fast and efficient service, in fact when headed back for another load, they actually jog! Moving to Sherman Oaks? Here are some helpful resources. and great attitude are unique and should make your company a leader in its field. View more Sherman Oaks resources. The movers were friendly, kind, and great! I thought all the movers were polite and cordial and wanted to do a great job and were willing to get things done timely while maintaining the care needed when moving other peoples stuff, which is key. The phone calls prior helped to make sure all things were in place and ready to go before the movers even arrived.